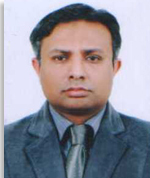 Dr. Amir Shafeeq achieved degrees in B.Sc. Chemical Engineering and M.Sc. Chemical Engineering from Institute of Chemical Engg. & Tech. Punjab University Lahore in 1998 and 2000 respectively. He got degree in Masters in Business Administration (MBA) from Institute of Business Administration Punjab University Lahore in 2002. He completed his PhD in Chemical Engineering from Universiti Teknologi Petronas Malaysia in 2008. He has about 48 Journal and conference publications in his credit. He has also written a Book Chapter published by Springer in 2008 and a Book published by VDM Verlag Dr. Müller in 2011 in the area of Batch Process Scheduling. His areas of research include Separation Processes and Process Integration and Intensification.